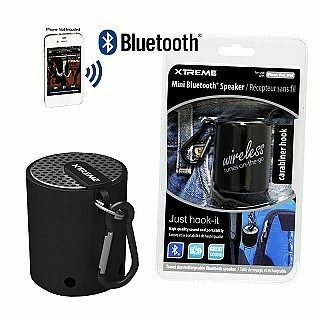 XTREME Portable Wireless Bluetooth Speaker w/ Carabiner Hook - One for $13 or Two for $20 Plus FREE Shipping! You are here: Home / Great Deals / XTREME Portable Wireless Bluetooth Speaker w/ Carabiner Hook – One for $13 or Two for $20 Plus FREE Shipping! XTREME Portable Wireless Bluetooth Speaker w/ Carabiner Hook – One for $13 or Two for $20 Plus FREE Shipping! Created for all Bluetooth Devices, this Rechargeable Bluetooth Speaker streams music wirelessly for up to 8 hours playback! The XTREME Portable Wireless Bluetooth Speaker w/ Carabiner Hook – One for $13 or Two for $20 Plus FREE Shipping is portable and great for travel!